We bring you a gentle blend of oils to create a luscious butter which is a soft-solid yet melts on contact with the skin. The addition of Coconut and Lime Oil makes this butter inviting to the nose. 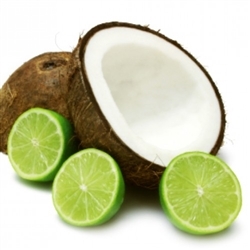 Cosmetic Uses: Coconut Lime Butter is suitable for a variety of skin care applications including lotions, soaps, skin creams and lip balms. Use it to enhance moisture and to include the properties of Coconut and Lime in your formulations. Suggested Usage Levels: Lotions & Creams: 3-5% | Balms: 5-100% | Bar Soaps: 3-6% | Hair Conditioners: 2-5%. Use from 3% to 100% pure (as a butter-like balm).